Here it is. No gimmicks and no things to buy (unless you don’t have a suitcase opening backpack). And it works, because this is how I packed it when we left Poland and it is in pretty much the same condition now. The worst part of living off a backpack is that when you need to find that particular top/pants/something you end up digging around and messing everything up. Or at least I do. 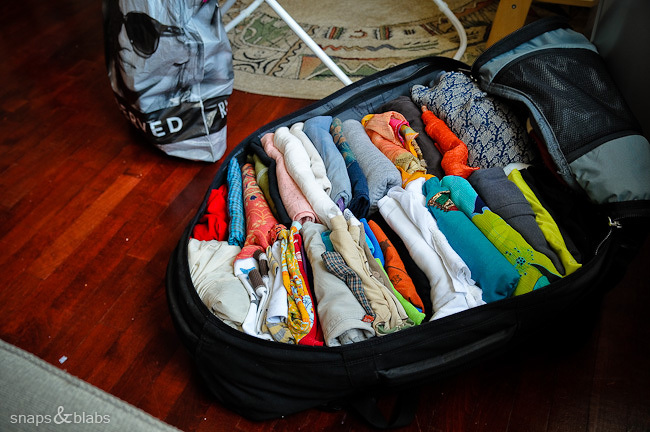 This way of packing ensures quick access to everything and best of all, that you don’t forget about the clothes at the very bottom, which you end up carrying around, but never wearing. – How much kilos does this backpack take? – Do you have one or two of them or more? – How much do the children carry, especially Little B (she should be of an age with my daughter)? – And how much carrying is actually involved when backpacking – I mean, we are not out to go trekking… so, a “real” giant trekking backpack may be the wrong idea to start with, eh? Jenny, then you imagined me correctly. This is not me. At all. That is why it is a very good way to pack, it works. – As much as I can carry. It is a One Planet, made in Australia and sturdy as a horse. – Miss Fab’s is about 8-9kg. Little B is probably about 4-5kg. – Not a whole lot, really. We used them a lot for moving around in Asia, but we are talking about short stints every 5 or more days. Still, a good bag is worth it, especially when its hot and you have kids to care for as well. You want to be comfortable. I would say buy the smallest backpack you could get away with and you will just have to deal. Definitely “suitcase opening” one, the real trekking ones, that have just a top opening would be a nightmare to live out of. Great post. We will be traveling with our 6 and 10 year old for a year. As adults, in our “before children life” we have backpacked through many countries but were have been thinking of rolling luggage for the RTW with the kids. Do u ever wish for wheels or are you happy to all have backpacks? Thanks, Kelly. Life would have been horrible with rolling luggage in Asia, not many places where it could be used. The flexibility of a backpack is wonderful for running with, leaning on, stuffing it in weird places, piling it on tuk-tuks and etc. So, even though there have been moments I wished for wheels, overall we made the right choice hands down. Thank you for the post. This suitcase takes way more clothes than I imagined. I had never heard of a suitcase opening backpack so thank you. Me neither, until I started looking into what what backpacks we should buy. If you go for a backpack, definitely buy a side opening one. Sorry Gerri – gotta disagree with you! We used wheelies all throughout Asia and maybe 3 times going down to a boat was it a problem (in that we had to carry them instead of rolling them). India you would think would be a problem since you have to go up and down stairs all the bloody time in train stations but they have porters who grab your bags instantly and carry them off for you at 50 cents a bag! Also – I use eagle creek pack bags – separates each kids clothes into their own section, one for bathings suits, one for sarongs. When we get somewhere I can just grab the bag I need and leave everything else in the suitcase. But the photo is pretty darn impressive! Ainlay, I am sure that is the case, but you traveled a bit posher than us. We would have never been able to fit all five of us and luggage in a one tuk-tuk with bulky wheels. No porters where we stayed either or budget to pay, when it is something that we could do ourselves. And the times we have walked through streets unfit for feet, let alone wheels, to get to our accommodation alone made our choice perfect for us and our style of travel. That’s a perfect way to pack a backpack, especially when you want to fit in many things. 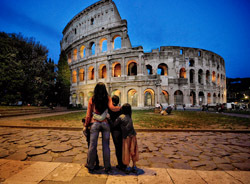 Experience is the best teacher and you learn a lot being a traveler. A quality backpack should have padded straps that go over the shoulders, across the chest and around the hips. Women’s packs are made with narrower straps and shorter torso lengths. If you plan to carry water bottles, make sure the pack has external pockets correctly sized for this. If you plan on using a pack bladder or hydration system, confirm that it’s compatible with your backpack. Some backpacks come with a hydration system. Muminsouthamerica, we don’t carry much toiletries. The one other pair of shoes I have is squeezed at the “bottom” or right side of the bag. Underwear is in the cream-colored cloth bag squeezed this time on the left. Any extras go on top before I close the bag, as there is plenty of space. The main reason I like this setup is because I can see ALL the clothes and don’t end up carrying a bunch without even remembering to use them.